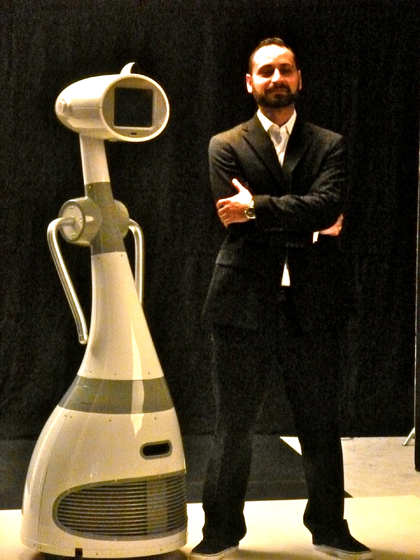 A little while ago, we and our friends at ImTech were able to sit down with CEO of RoboDynamics, a Santa-Monica based telepresence robotics company and get an in-depth look at their new project, LUNA. 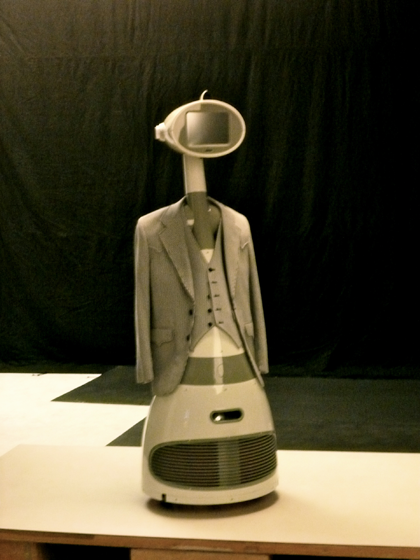 Since ‘her’ official introduction in early May in blogs like Engadget, Crunchgear, Gizmodo, etc. 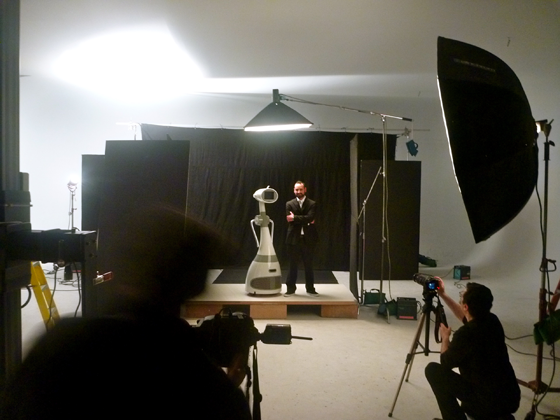 there’s been plenty of buzz about the world’s first consumer-friendly home robot. 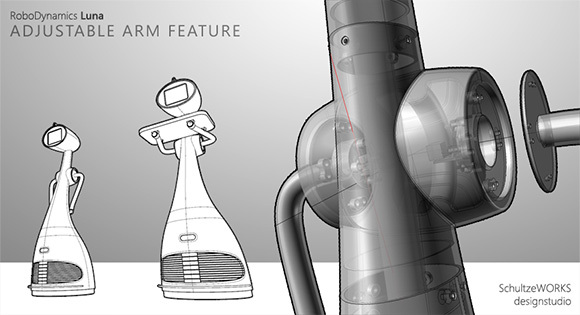 Check out the interview with Fred Nikgohar, CEO of RoboDynamics as he talks about upgraded features on the unit over past models and a little of RoboDynamics’ vision for where they see LUNA fitting in the future of personal robots. Also, check out some of the pictures we snuck during the photoshoot! 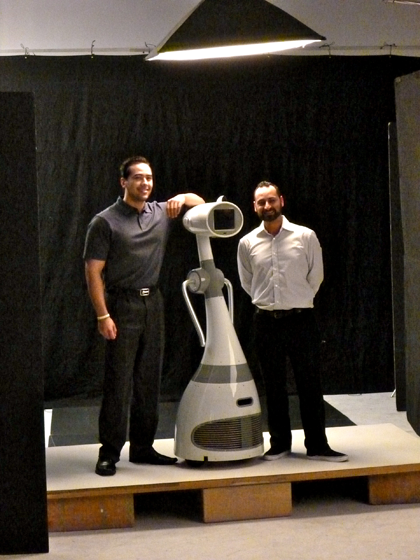 ImTech: We’re back with the CEO of RoboDynamics, Fred Nikgohar. 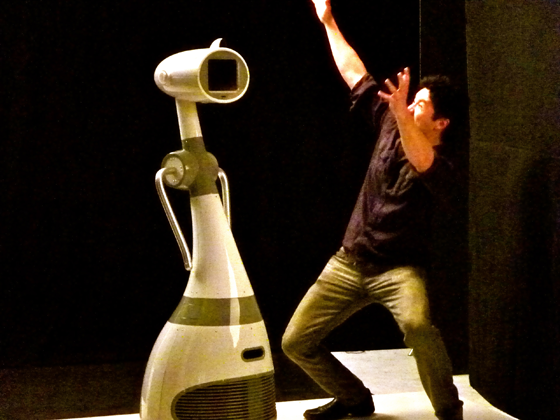 He rocked the summit with his robot TiLR, but now there’s a new star present called “Luna”. ImTech: Yup, definitely taller, looks a lot slicker. Can you tell us a little about it? 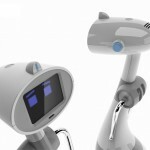 Fred: So, LUNA is the world’s first personal robot. Really what that means is it’s a platform for people to create (inaudible) robots that can live and work with humans. 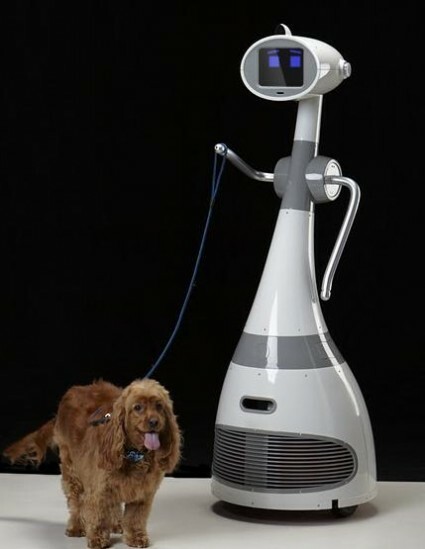 There have been a lot of robots for the last 30 years, but there really hasn’t been until today with a robot like LUNA that you have three things simultaneously on the same platform: A tall-human sized robot to interact with humans, has a certain type of look for emotional engagement so you’re willing to live with it in your home or office, and is able to be programmed similar to an iPhone or a PC as opposed to robots today that you would need three phD’s in robotics just to get your way through. 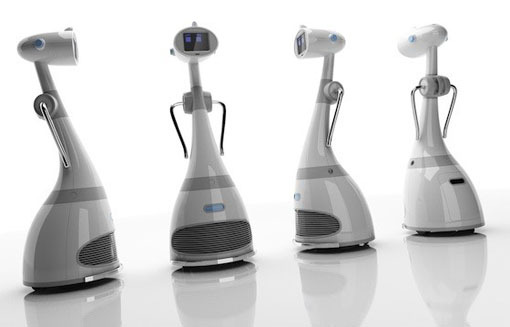 ImTech: So from what I understand, so not to compare this to TiLR the predecessor as it would be apples to oranges, this is no longer just a telepresence robot, I mean, this is your personal robot correct? Fred: Correct. It’s really an apples to oranges comparison in that TiLR was a single utility robot that did telepresence very well and that’s our pedigree as a company. So with LUNA you’ll be able to download different telepresence applications available right out of the box through the app store. But what’s unique about this robot is that it has an app store; this means that there’s a unified way to program for it and distribute these programs. One-click installs will make it super easy for the users to make it do all the things that she doesn’t necessarily do today, but will do 2-3 years down the line. ImTech: So that naturally leads to the question of development and content. Will this be available to the public with open source, or will there at least be a developer kit? Fred: Yeah, so first of all, so she’s open source every which way, not just software. Software-wise it has a Linux stack and a ROS system, but we take ROS to a whole new level, meaning, we’re doing two things with that. We’re making it a lot easier for programmers to program and for consumers we’re making it a lot easier to use with a PC or a smartphone where you can easily install applications. ImTech: Could you show some new features? There appears to be a lot of slots and ports to connect to other devices. Fred: When we say apps we really mean software and/or hardware. For example, these arms, if you come up with a better arm design and wanted stronger more articulated arms you just pull these out and behind them there are what we call Luna Expansion Ports (LXP). Which not only give you communication with standard USB stack but gives you power directly through the power supply, so you’re no longer limited by the power the USB provides. There are eight LXP ports throughout the body of the unit. You can use any of these ports to extend these (hardware and software) apps. ImTech: The port down there looks great for a 3D camera! Fred: So one of the things that has been lacking in robotics is an inexpensive and reliable way to do 3D mapping. With something like a Kinect sensor which you can buy for something like a hundred and fifty dollars, you can use an affordable robot like this combined with an affordable sensor and take it to the next level. ImTech: So the face if you will of the robot seems to be a great platform for creativity if you want to see an animation or someone’s face. Fred: Yeah, we have these things called personality packs, which when you think about your cell phone when the batteries are running low you’ll see a red icon. Whereas with LUNA’s face you might see an animation of a robot licking her lips to say that she’s hungry. So these events and responses to stimuli that you can install animation packs for puts it one step closer to having a personality. ImTech: Awesome, so with the aesthetics, it’s much less raw than TiLR, much more feminine in the looks, which is nice. Fred: We like to joke that this is the first girl robot that we’ve made. She’s definitely feminine, we designed her aptly. But more importantly, I’m not aware of any robots out there in any class outside of toys that have such a refined look, and that was one of the three goals of creating LUNA and how we define a personal robot. Not only did it have to use standard technology to make it easier for developers, not only does it have to be affordable, but it also has to resonate with the consumer on an emotional level. This is something you have to be willing to live with in your home. ImTech: Sure, now naturally, that leads to interface. How do you interact with and control LUNA? Voice control? Computer? Laptop? Cell phone? Fred: That’s a great question. There’s no single way. There are a lot of different sensors, but you also have things like Wifi. There’s a reasonably beefy PC in there that runs Linux. Whether you’re making an application that runs through a smart phone or the web, or some autonomous application that runs locally through the robot such as with camera, sensors, voice. ImTech: Sounds awesome. And of course, it will be web connected and accessible pretty much everywhere. Fred: Right. 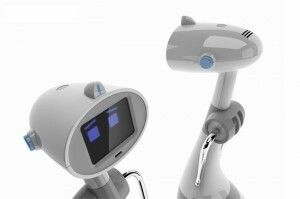 Our pedigree is in telepresence, so it means that you have a robot and a client device (i.e a smart phone or a laptop on the other end controlling the robot). So we’ve become fairly good at that in the last seven years, but as we were building this we realized that people would be hacking this for sure, so we said why not just build a robot that doesn’t need to be hacked but can be developed for in a methodical systemic way. And if you do that, there’s a uniform way for the customer to have a simple experience of one click installation. ImTech: Sure. So we know that this will be the star girl at all the games and parties to bring me a beer or a drink, and it gets all these features, but now, as for price point, I hear this will be revolutionary as well. Fred: Really, the biggest innovation with LUNA is not so much the technology that we’ve been developing for seven years but that you can buy this for the average price of a laptop. We’re not releasing pricing as of yet but suffice to say, by 3rd generation we’ll be looking at about $1,000. If you can afford a good tablet or computer, you should be able to afford one of these. ImTech: Cool. Definitely a consumer product, not just for the labs. We look forward to further updates. Thank you very much Fred! So it’s a Linux computer on wheels with some software that makes it navigate a room without bumping into objects, but apart from that, it doesn’t really do anything. Instead, the makers are pointing out that the OS is open source, so they’re hoping “the community” will develop apps for it that will make it do really cool things, or even develop new hardware, like “real robot arms”. In other words, they’re hoping anybody else will develop the real robot parts, the real artificial intelligence. How come the interviewer doesn’t ask “what does it do out of the box, why should I buy this”? The company thinks, just because developers wrote a lot of software for the iPad, which apparently they consider useless out of the box without 3rd party apps, 3rd party developers will make this computer on wheels a real robot, and all the company itself has to do is sit back and wait and sell these devices for $3000.-? Honestly, I’ve read a lot of “reviews” of this thing, and nobody really knows what to do with it (but nobody asks this question, either). The answer is simple, you can’t do anything with it, and if you hope some open source developers will turn this thing into a useful robot in their spare time, dream on.